Two federal surveys tracking drug use rates show marijuana use continues to rise in Colorado. First, let’s look at the national Monitoring the Future study conducted by researchers at the University of Michigan for the National Institute on Drug Abuse. This survey of students in grades 8, 10 and 12 shows that while use of other drugs has declined — which is very good news — use of marijuana among adolescents, including heavy marijuana use, remains stubbornly high across all categories of study. These marijuana use rates are also higher than a decade ago. The study also shows that students in states with lax marijuana laws, such as Colorado, are much more likely than students in other states to ingest THC, the active ingredient of cannabis, in candies and other edible forms. Among 12th graders reporting marijuana use in the past year, 40.2 percent consumed marijuana in food in states with medical marijuana laws compared to 28.1 percent in states without such laws. Also troubling about the country’s high school seniors: 6 percent of them report daily or near-daily use of marijuana — which is defined as use on 20 or more occasions in the previous 30 days. That rate of daily use — which translates to one in every 17 12th graders — has remained the same since 2010. While Monitoring the Future is a helpful national survey, it also has limitations that are very important to understand. Chief among them are that results are not broken down by state, and only students who are in school at the time the survey is administered take the survey. Students with drug problems are less likely to be surveyed because they are less likely to be at school. To review the latest Monitoring the Future results, visit here. Past-year and past-month marijuana use rates have risen sharply for all age groups surveyed — 12 and older; 26 and older; and most sharply among Americans ages 18-25, adolescents who are still in important stages of brain development. You can find the 2014-15 National Survey on Drug Use and Health, data collected for release by the Health and Human Services Substance Abuse and Mental Health Administration (SAMHSA), online. This national household survey’s results are broken down by state — and reveal that Colorado is still No. 1 in the country for marijuana use. Colorado’s use rate among 18 to 25-year-olds is skyrocketing. 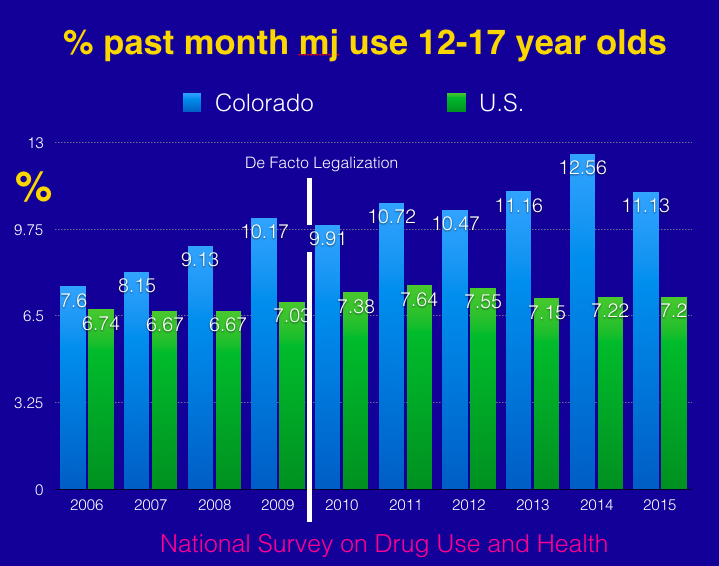 This information is consistent with problematic increases in marijuana use recorded by the Colorado Healthy Kids Survey released by the Colorado Department of Public Health and the Environment earlier this year. “Hence, from the period of great expansion of medical marijuana in that state, along with the passage of legalization, until today, marijuana use has increased 31 percent for those 18-25. Again, where were press reports about that fact? “For 18-25 year olds, even past-year use … also increased by 17 percent over the longer period, and adjudged statistically significant at the 0.05 level (38.59 percent to 45.24 percent). “The policy-relevant message lies in the following realization, which seems to have escaped many commentators: Youth will age, every year, into new categories. Those who were exposed to the changes in Colorado marijuana policy when aged 16/17 in 2013 are 18/19 (in a new age category) by 2015. And their use of marijuana is rising, just as those aged 24/25 in 2013 are now in the category 26+, rising the most steeply in marijuana use. They take their norms, attitudes and behavior with them as they age. Dr. Christian Thurstone is an associate professor of psychiatry at the University of Colorado and the co-author of Clearing the Haze: Helping Families Face Teen Addiction.